Quality PC port, including graphics and control options. 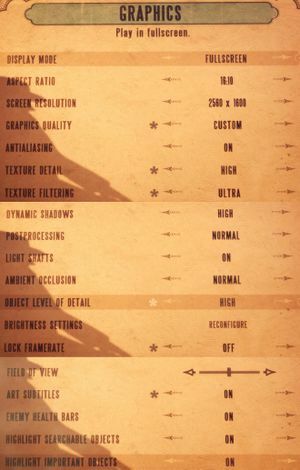 The game has a built-in benchmark mode which can be accessed through launcher in Advanced menu. On Linux however, you must add DefaultPCBenchmarkMap.xcmap -unattended into the Launch Options to access it. Aim assist is on by default even when not using a controller, but can be fixed. Extract to the installation folder and replace all files. May cause game to enter an infinite loading loop. If it does, turn texture streaming back on, leave that area of the game, and turn it off again once you leave the area. Exiting to desktop or main menu reveals the local date of the last checkpoint. Key mappings are encrypted which prevents sharing key bind files or creating custom commands. 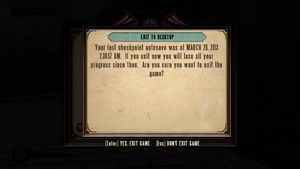 Game creates an automatic permanent save at the beginning of each chapter. These saves are automatically overwritten if replaying from a previous chapter. Full 3xLandscape. HUD may not be centred by default; see Multi-monitor. GUI may be too small. See GUI scaling on high resolution displays. Limited FOV adjustment of 15º. See Field of view (FOV). On Windows, set fullscreen mode to "Fullscreen (Windowed)". Option is called "Lock Framerate". The HUD may not be centred automatically for multi-monitor setups. Change SafeRectX0 and SafeRectX1 to area you want to HUD to be within. Change SafeRectY1 to the height of your monitors. There is a FOV slider in the game options, however it only increases/decreases FOV by 15% from the default value of 70º (59.5º - 80.5º). Locate line MaxUserFOVOffsetPercent=15.000000 and change its value to 100 for maximum variability. This value is in percent and not degrees. See table below for precise field of view values. Start the game and set your field of view via slider in menu. Default FOV slider to the max. Slider offset set to 100 and slider set to the max. Some of the post-processing effects can only be disabled in the game's XEngine.ini file. These effects include depth of field, light bloom, and color correction. Some keys cannot be rebound in the Burial at Sea DLC. "F" is always "take all" when looting. ↵ Enter, ← Backspace, Tab ↹, and Esc are reserved for menu commands and cannot be bound. Precise customization only available through INI edits. Slider for mouse speed is set to very wide range, which can be unsuitable for high precision mice. Start the game and set your desired sensitivity via slider. This fix will modify the in-game slider and give better control. Master, music, SFX and voice. Auto configures up to 5.0 output. Linux only. In alsoft-config set HRTF Mode to Force On at the HRTF tab. Use Helix Mod: Bioshock Infinite. There have been reports of crashing and freezing, possibly related to i7 processors. 2K is aware of this issue and there should be patch soon. If the game crashes on start-up, disable any on-screen display applications like MSI Afterburner. Disable overclocking or underclock your graphics card. Disable Killer e2200 PCI-E Gigabit Ethernet Controller or any other virtual/VPN network adapters like Hamachi. When the game can't detect or detects wrong video memory size, it automatically enables only Very Low and Low options for texture quality. There is also an issue on some systems that selection Very High or Ultra for texture quality will cause to textures never load properly and game tries to load them over and over. Nvidia cards experience FPS drops in certain areas when Dynamic Shadows is set to Very High or Ultra. Aim assist is on by default even when using keyboard and mouse. There are some auto aim variables in the .ini files but these variables are reverted to True every time you start the game. There is no permanent fix yet. This fix affects user options configurations, if you need to make a config in game do it before try this. Save your changes and make XUserOptions.ini read only. This fix needs to be applied every time the game is started. Start the game with a controller plugged in. Go to controller options and turn off Aim Assist. Unplug controller and play the game. GUI elements are not scaling with resolution which makes these elements rather small on high resolution displays. Locate lines MaxResolutionUpScale=0.0 and change value to something between 0.0 and 1.0. See screenshots for examples. Run the game with the -windowed command line argument. Open the graphics options and set the game to run full screen. Close the game, remove the launch option, then restart the game. Let application create sample script. This script file should open after installation. Delete everything and insert the lines below. Open AutoHotkey window (green H icon in tray area), navigate to File and hit Reload Script. This is script for default bindings where aiming is bind to middle mouse button. For aiming by right mouse button replace MButton for RButton. For bindings to other keys, see Hotkeys and KeyList sections of AutoHotkey documentation for button syntaxes. If your zoom gets stuck, you can reset with the run key. Right-click on BioShockInfinite.exe, go to the compatibility tab, tick the box and select Windows Vista Service Pack 2. Set the PoolSize variable in XEngine.ini to about 400 less than the total number of Megabytes RAM your video card has (e.g if you have 2048 MB of video RAM set this to 1600). Add this launch option in Steam: -ReadTexturePoolFromIni. 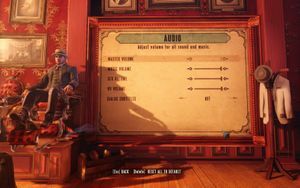 Bioshock Infinite auto-detects any controllers/joysticks attached to the system including virtual ones. This could make the game uncontrollable, cause the camera to spin, and label the menu with Xbox prompts. Remove all physical controllers and joysticks. Disable virtual adapter for 3DConnexion devices. To disable controller support, edit %USERPROFILE%\Documents\My Games\BioShock Infinite\XGame\Config\XEngine.ini and change AllowJoystickInput=1 to AllowJoystickInput=0. Save your changes. These forms of V-Sync significantly reduce micro-stuttering. For Nvidia cards, Adaptive V-Sync can be enabled through the driver control panel. Set Vertical sync to Adaptive. For AMD cards, Dynamic V-Sync can be enabled using the third-party program RadeonPro. 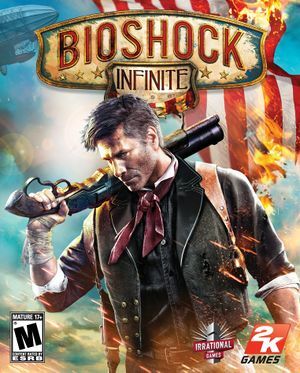 Click the Add new profile icon and find the BioShock Infinite executable (BioShockInfinite.exe in <path-to-game>\Binaries\Win32\BioShockInfinite.exe). Click the newly created profile and click the Tweaks tab. Set VSync Control to Always on. Enable Dynamic Framerate Control and set Keep up to to 60. Mice with high polling rates can sometimes cause microstuttering. Click on the "Performance" tab. Change the "Polling Rate" to 125 Hz. Launch the game with --eon_force_display=#, replacing # with the index of the monitor you want the game to launch on. In a multi-monitor configuration where 1 monitor is portrait and 1 monitor landscape and where game starts on portrait monitor and is forced to run on the landscape monitor using --eon_force_display, game does not recognize landscape monitor's aspect ratio and will only allow portrait aspect ratios/resolutions. No real fix is available at this time. De-rotating the portrait screen will allow selection of landscape aspect ratios, but it is not persistent. The portrait monitor must be de-rotated before playing as a workaround. In XUserOptions.ini setting ResolutionX=<DesiredWidth>, ResolutionY=<DesiredHeight>, and DisplayMode=0 (fullscreen) will allow the game to run in widescreen, but you are restricted to fullscreen play. The game uses mouse acceleration, even if mouse acceleration is turned off in-game. This will disable mouse acceleration in your system before launching the game and enable it again when the game closes (which might take a couple of seconds). Graphical user interfaces for mouse settings (e.g. mate-mouse-properties) might not be aware of the changes. It's best not to touch them while the game is running. 3.3, 4.1, 4.2 3.3 on OS X, 4.1/4.2 on Linux. SDL Linux only, for gamepads. This page was last edited on 25 April 2019, at 22:43.